For its new trade show, SommelierS International thought big. Few steps away from the Arc de Triomphe, wines and spirit producers but also numerous gastronomic partners got together at Hôtel du Collectionneur in Paris. For this event, SommelierS International could count on the presence of prestigious guests: not less than three Best Sommeliers of the World, Paolo Basso (2013), Gérard Basset (2010) and Philippe Faure-Brac (1992) came to meet the exhibitors. 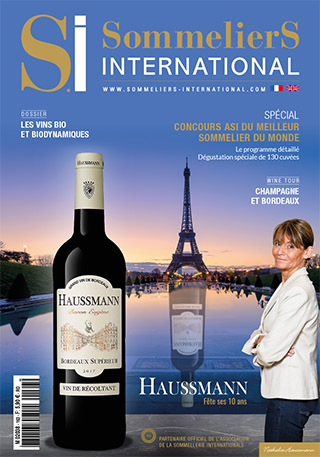 With the Salon à la Française trade show, SommelierS International has, for its new formula, decided to spotlight producers and merchants of France. The greatest vineyards were represented through some 300 products. With the objective to emphasize on France’s technical and gastronomic expertise, the event welcomed some top-notch partners. The Union of French Sommellerie were present once again and the producers could meet the sommeliers from Burgundy, Bretagne, Champagne, Hauts de France, Paris-Île-de France and Lorraine. The fair also attracted numerous barmen, wine merchants, bloggers and wine specialists. Unique case realized by laser cut, every creation is the fruit of a graphic work. The open-worked front gives a glimpse of the product and sublimates the bottle. Eco-friendly, the cases are made with natural or recyclable materials such as wood and can later be used as a lamp or a decorative object. After 3 years of research, Michael Paetzold, enologist, winegrower and oenotechnic process specialist, and Olivier Caste, great connoisseur and collector, managed to quantify and measure the contribution of the oxygen necessary to optimize and free of the aromas in the bottle, creating the Optiwine aerator. The Optiwine pocket carafe presents itself as a precise tool, created to enable a long and optimal tasting. To cool the palate during the tasting, the professionals could appreciate the natural mineral water Abatilles. Water coming from the heart of the Southwest, in the Bay of Arcachon, Abatilles possesses natural qualities and undergoes no treatment before bottling. Pierre Talbot again enchanted the palates with his luxury foie gras. Sublimated by Perles de Cognac de Luze, all the visitors could appreciate the wide range of products proposed for tasting, such as the whole duck foie gras sublimated with 1st Grand Cru Classé of Sauternes or the whole duck foie gras, recipe of 1908 of the grand Café Castel Villeneuve-sur-Lot with Perigord black truffle. Both foie gras house and taste editor, the Masse house also proposes a rich range of complementary products with foie gras. Revealing the talents of the producers, Masse maintains a close relationship with the chefs to develop products adapted to the constraints of their job. During the event, besides a selection of foie gras, the house presented in particular his Cecina de León IGP. Jean-Marc Rué and Keiko Orihara offered the participants of the event a real gustatory pleasure, with the tasting of their chocolates, but also visual thanks to two magnificent chocolate pieces, representative of the City of Light: the Eiffel Tower and the Arc de Triomphe. Sturia is the flagship brand of the first French producer of caviar Sturgeon created 20 years ago near Bordeaux. With a production of about 12 tons sold all over the world, Sturia contributes to promote the French gastronomy internationally. On March 6th, the house presented its vintage caviar. Grandes Distilleries Peureux, with its 150-year-old savoir-faire, proposed their Purple Rain cocktail, served in the Cristal de Sèvres piscine cocktail glasses. Made with tonic water, cranberry juice and Purple Gin®, unique product in its category, this cocktail offers freshness and pleasure thanks to the final addition of some Griottines®, providing a surprising character, comparable to the sensation of tasting an tangy sweet. For the lunch the Gérard Bertrand vineyards proposed their Crémant de Limoux Code Rouge, Château Villemajou cuvée 2012, Aigle Royal Chardonnay 2015, to make discover the talent of the Languedoc-Roussillon wines. To finish, Vinovalie offered Château de Cayx 2015 in red and La Cigaralle Chardonnay 2013, nice representations of the Cahors wines. We suggest you discover the reviews of these cuvées in the following pages. SommelierS International would particularly like to thank all the participants in this event as well as the National Interprofessional Body of Cognac for tis presence and the Ecofih school for their help during this day.